A heads up to anyone going up the Nose. A serious hazard at the belay on pitch 17 (ST topo) has been reported by several recent ascesionists. Spread the word. It's been a terrible season for loose rock tragedies in the Valley. Perhaps we can avoid another. I can't imagine that the rock is more dangerous than before. There was no big change in weather or earth quake in the area at my knowledge. What explain that there is more tragedies due to loose rock in the valley? if you walk 1 mile on any road, you will find at least one nail to get you a flat tire and climbing 3000+ feet vertical does contain hazards no matter how you look at it. climbing 3000+ feet vertical does contain hazards no matter how you look at it. Yes I know. I climbed in remote area in Quebec, where you are not looking at loose rock because there are so much , but you are looking at good rock as they are scarce. skiclimb said: "It's been a terrible season for loose rock tragedies in the Valley". so my question was why this season was terrible for loose rock? I can have an answer. When someone is not introduce to loose rock from the beginning, he transfers his knowledge from what he learned to cam and stopper. As most people used bolt at the beginning they transfer their knowledge from bolt to cam. They prioritize short distance placement in obvious place and don't look at what happen to the rock in a fall or when they set an anchor under it. Erosion, is not just in earth. The rock also have erosion. When we take out a piece of rock for safety purposes, we changed the equilibrium and larger part of the flake may fall at a wrong moment...specially if I am in the route. That's not what he said. It's not a terrible season for loose rock, it's a "terrible season for loose rock tragedies." Two high-profile deaths on El Cap from climbers dislodging blocks onto themselves or the belayer. He was just admonishing climbers to be careful, especially in the spring when things do have a greater chance of being loosened from the winter. It's probably no more loose or unsafe than prior seasons, but this year some people got real unlucky. There was also an apparently spontaneous rockfall on El Cap that swept over some pretty popular terrain. That isn't particularly out of the ordinary - only the location. Fortunately that rockfall incident didn't nail anyone. when 150 lbs of rock is falling on you, there is not much of an option you have other than asking god to let you live one more day. Why waste your last words. it's a "terrible season for loose rock tragedies. 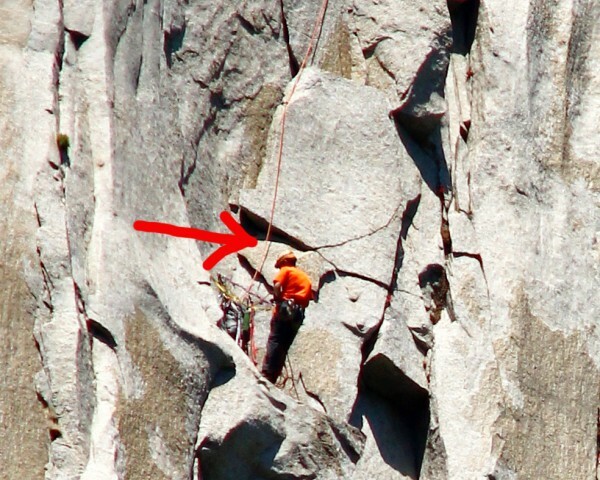 [..] Two high-profile deaths on El Cap from climbers dislodging blocks onto themselves or the belayer. He was just admonishing climbers to be careful. I don't see contradiction with what I said. I just admonished climber that, in there learning process, one can ignore the danger of cam lever on rock. Instead of saying that the rock is bad, maybe we can ask ourselves if we transfer our knowledge from safe anchor made with bolt to rock without taking attention of the danger or if we should do the contrary, transfer our knowledge from safe rock anchor to bolt anchor for dangerous run out or loose block situation. Egads folks don't overcomplicate things so much. Simply put there is a big precarious loose flake hanging there. If you or anyone you know is heading up it couldn't hurt to mention it and it might just save lives. Is it feasible to close the face down for a day, rap in and trundle all the loose and dangerous stuff ? Yes, theoretically, but it would require both consent and coordination with the NPS, both on the wall and on the ground. Realistically trundling *all* the "loose and dangerous stuff" is an impossibility. About the only thing that can be done is to jettison a couple of known hazards. There would also be a need to have one or more parties in place to repair any damage - smashed rivets, sheared off anchor bolts, other stuff that becomes unstable after being hit by rockfall, etc. The whole affair rapidly becomes a logistical mess. Understood :) They did the same thing as I suggested here in Colorado at Clear Creek Canyon when the whole road was closed last year for cell tower installation. Routes are at most 3-4 pitches here though. C'mon... like you've never gone up a route with a crowbar? There has been some discussion about possibly trying to stabilize the flake with slings or somesuch temporarily until winter when someone could go up and trundle it safely with no one below. It's tricky and a lot of work. You'd have to devise a foolproof way not to dislodge the flake during the process. Unfortunately it hangs above the busiest part of el-cap and is not just a threat to those at the belay. Perhaps some local valley hotshots will get it done. It is not likely to be done by a regular group that is plenty busy just climbing the route. +1 to trundle it/bolt it in place. If it is so loose that it will dislodge while bolting it, then make sure nobody is below it.